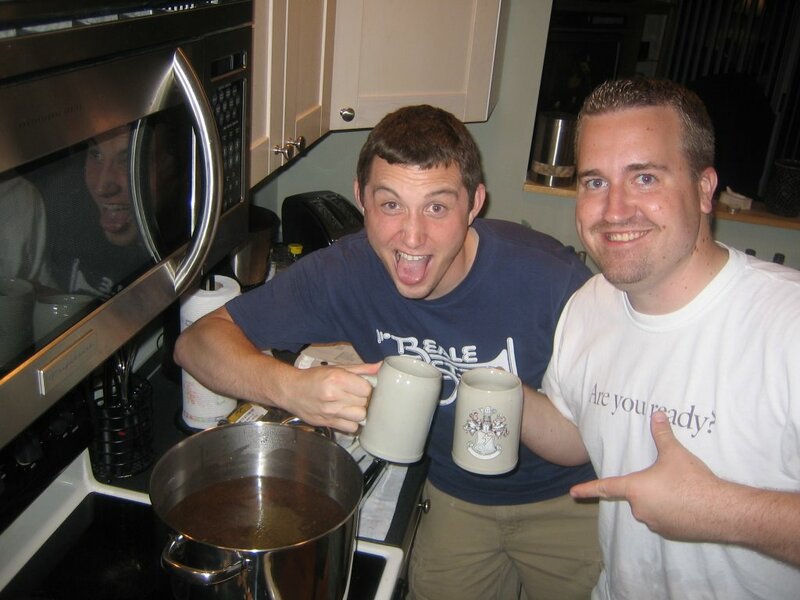 The Brew Lounge: Homebrewing: Gabe's first batch! Gabe and Jeremy are pictured here brewing Gabe's first batch of hombrew. Great to see some new hombrewers out there :-) As you can see Gabe is very exited ;-) Thanks for the Weyerbacher ESB and dinner. Hey Jackie are you brewing a batch too? Gabe & Jeremy, Can you give us the run down on this little experiment/competition you have going. -Adam Gabe's response... Where to start... well, since I have a horrible tendency to draw out an explanation, I'll make this short and to the point! Five of us (well, six if you include Bryan who is helping Adam), are going to be making a homebrew of our own. Some of us are following recipes we've found while others are being a bit more original and trying something new. The original idea was we'd all try to make an Oktoberfest style, but people have branched out just a bit since then. Sometime in September we'll all get together to taste the fruits of our labor with the group and critique each other's brew. If this goes well and we maintain an interest as a group, we'd like to do a brew every quarter and get together four times a year to taste and share recipes/stories. Nope, no home brew of my own. But I'll be happy to enjoy the fruits of their labor. Where to start... well, since I have a horrible tendency to draw out an explanation, I'll make this short and to the point! Five of us (well, six if you include Bryan who is helping Adam), are going to be making a homebrew of our own. Some of us are following recipes we've found while others are being a bit more original and trying something new. The original idea was we'd all try to make an Oktoberfest style, but people have branched out just a bit since then. Sometime in September we'll all get together to taste the fruits of our labor with the group and critique each other's brew. If this goes well and we maintain an interest as a group, we'd like to do a brew every quarter and get together four times a year to taste and share recipes/stories. Things went pretty well... we were done by about 10:30. Thanks again for letting us borrow the wort chiller and thermometer. We ended up having to chill the wort outside in the heat! My hose water wouldn't drop below about 73 degrees... but we ended up getting it down to 70 with a bag of ice Gabe brought. I drank a few Stoudt's Weizen's during the brewing process. Tonight we are going to make my "Bold Series" Dortmunder. I got a head start on you and brewed by Oktoberfest last Thursday. I did an all-grain brew of my own recipe. We'll see how it turns out. I have started posting my recipes here for everyone to see. Feel free to add anything to the site that is helpful. Homebrewer's Tip: Spent barley from mashing will clog your kitchen sink. Can't wait to taste your brews.